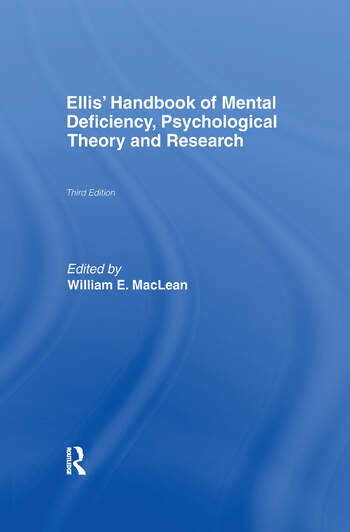 In the 16 years since the publication of the second edition of this volume, psychological theory and research in mental retardation has continued to expand and extend scientific, theoretical, and clinical understanding of this most complex and challenging human condition. Explicit effort has been made to translate theory and research into useful and efficacious assessment, intervention, prevention, and policy actions. This third edition provides an opportunity to critique major conceptual developments and empirical research in an effort to stimulate further behavioral research of practical, social importance. The Handbook presents work by prominent contributors to a major scientific endeavor that has grown dramatically during the last three decades. The challenge for each author was to identify important theoretical and empirical issues, provide a critical, selective review of exemplary research, and discuss the questions that remain unanswered in each area. In short, the goal for this third edition was to consolidate the knowledge gained during the past 30 years and to present a blueprint for future research in mental retardation, the broader field of learning disabilities, and other developmental disorders such as autism. Providing totally different coverage and direction from the previous edition, this text fills a crucial instructional need in graduate courses related to the psychology of mental retardation. With its emphasis on psychological research and theory, it offers an important alternative to many available texts that primarily emphasize the application of research. Contents: Preface. Contributors. Part I: Introduction. A.A. Baumeister, Behavioral Research: Boom or Bust? D.L. MacMillan, D.J. Reschly, Issues of Definition and Classification. Part II: Contemporary Psychological Perspectives on Mental Retardation. T.L. Whitman, M. O'Callaghan, K. Sommer, Emotion and Mental Retardation. L.A. Thompson, Behavioral Genetics and the Classification of Mental Retardation. R.M. Hodapp, E. Zigler, New Issues in the Developmental Approach to Mental Retardation. S.L. Odom, A.P. Kaiser, Prevention and Early Intervention During Early Childhood: Theoretical and Empirical Bases for Practice. Part III: Psychological and Psychomotor Processes. C.L. Dulaney, N.R. Ellis, Rigidity in the Behavior of Mentally Retarded Persons. N.W. Bray, K.L. Fletcher, L.A. Turner, Cognitive Competencies and Strategy Use in Individuals with Mild Mental Retardation. P.D. Tomporowski, V. Tinsley, Attention in Mentally Retarded Persons. T. Nettlebeck, C. Wilson, Speed of Information Processing and Cognition. K.M. Newell, Motor Skills and Mental Retardation. Part IV: Social, Communicative, and Adaptive Processes. S. Greenspan, P.F. Love, Social Intelligence and Developmental Disorder: Mental Retardation, Learning Disabilities, and Autism. H.N. Switzky, Individual Differences in Personality and Motivational Systems in Persons with Mental Retardation. S.F. Warren, P.J. Yoder, Communication, Language, and Mental Retardation. Z. Stoneman, Mental Retardation and Family Adaptation. S.R. Schroeder, R.E. Tessel, P.S. Loupe, C.J. Stodgell, Severe Behavior Problems Among People with Developmental Disabilities.